There is a revised Chapter 2 that treats map-reduce programming in a manner closer to how it is used in practice, rather than how it was described in the original paper. Chapter 2 also has new material on algorithm design techniques for map-reduce. Support Materials include Gradiance automated homeworks for the book and slides. The authors note if want to reuse parts of this book, you need to obtain their permission and acknowledge our authorship. They have seen evidence that other items they published have been appropriated and republished under other names, but that is easy to detect, as you will learn in Chapter 3. LDA automatically assigns topics to text documents. How is it done? Which are its limitations? What is the best open-source library to use in your code? In this post we’re going to describe how topics can be automatically assigned to text documents; this process is named, unsurprisingly, topic-modelling. It works like fuzzy (or soft) clustering since it’s not a strict categorisation of the document to its dominant topic. Let’s start with an example: the optimal topic-modelling outcome for Shakespeare’s Romeo & Juliet would be a composition of topics of circa 50% tragedy and 50% romance. Surely, topics like social networks, football and indian cuisine don’t appear in the play, so their weights would be all 0%. One of the most advanced algorithms for doing topic-modelling is Latent Dirichlet Allocation (or LDA). This is a probabilistic model developed by Blei, Ng and Jordan in 2003. LDA is an iterative algorithm which requires only three parameters to run: when they’re chosen properly, its accuracy is pretty high. Unfortunately, one of the required parameters is the number of topics: exactly as happens with K-means, this requires a deep a-priori knowledge of the dataset. A good measure to evaluate the performance of LDA is perplexity. This measure is taken from information theory and measures how well a probability distribution predicts an observed sample. To evaluate the LDA model, one document is taken and split in two. 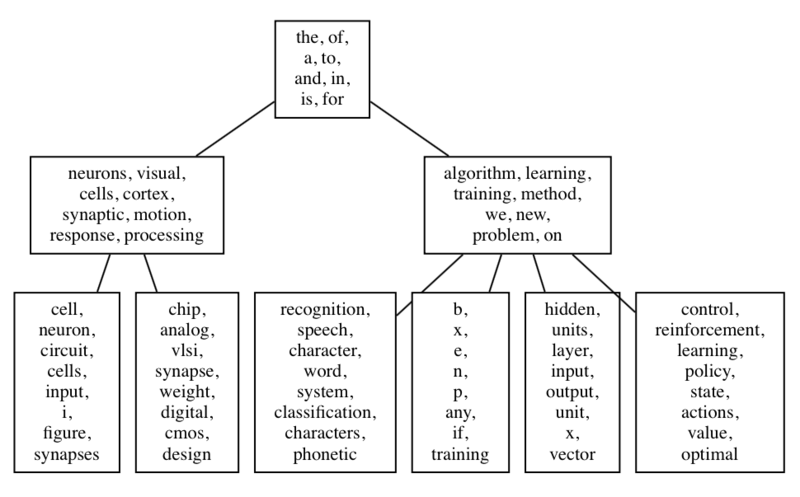 The first half is fed into LDA to compute the topics composition; from that composition, then, the word distribution is estimated. This distribution is then compared with the word distribution of the second half of the document. a a measure of distance is extracted. Thanks to this measure, in practice, perplexity is often used to select the best number of topics of the LDA model. Topic Modeling Workshop: Mimno from MITH in MD. For the bravest, this is the graphical representation of LDA: grey circles represent the observable variables; latent (also called hidden) ones are white. Boxes represent collections (repetition) of variables. φ and θ are Dirichlet distributions, z and w are multinomials. On the Internet there are a bunch of libraries able to perform topic-modelling through LDA. Note that the acronym LDA is also refer to another technique with the same initials (Linear Discriminant Analysis), but the two algorithms are completely unrelated. Now, in the follow, our point of view of some open sourced Latent Dirichlet Allocation Implementations. For each of them, we’re pointing out strengths and weakness, as well as simplicity to install and use and scalability. Features: university backed software, not optimised for production. Great for learning and exploring LDA on small datasets, understanding its parameters and tuning the model. Scalability: multi-threaded, single-machine. Good for small to medium collections of documents. Simplicity to install: simple. Jar distributed and Maven compilable. Simplicity to train the model: simple and very customisable. Infer topics on unseen documents: simple as well as training. Features: Very scalable LDA algorithm, able to scale across multiple hosts and cores. Code is very optimised, and requires experienced C++ developers to modify it. Scalability: multi-core, multi-machine Hadoop backed. Good for medium to huge collections of documents (it’s able to handle 1M+ documents). Simplicity to install: pretty complicated. A 4 years old linux box with many outdates libraries are required. Ice dependency is very tricky to install. Simplicity to train the model: cumbersome. It tooks a long while to make Yahoo_LDA working properly on a Hadoop cluster. Also, in case of error, C++ compiled code on a Java/Hadoop system makes the investigation of what went wrong very hard. Infer topics on unseen documents: simpler than the training phase. Features: Very scalable LDA algorithm, able to scale across multiple hosts and cores. Code and algorithms are very optimised, and requires experienced C++ developers to modify it. Scalability: multi-core, multi-machine through MPIs. Good for medium to huge collections of documents (it’s able to handle 1M+ documents). Simplicity to install: pretty simple (cMake), with few dependencies to install. Simplicity to train the model: pretty simple, even in a multi-machine environment. Following the easy documentation, LDA simply works. Infer topics on unseen documents: complex. There is not an out of the box routine to infer topics on new documents. Creating that inferencer is not so complicated, though. Note: recently, documentation of LDA has disappeared from the website. Fortunately, it’s still available from the internet archive. Features: Very scalable LDA algorithm, distributed, able to process input collections larger than RAM (online learning) and easy to use. Scalability: multi-core, multi-machine through RPCs. Good for medium to large collections of documents (it’s able to handle 1M+ documents). Infer topics on unseen documents: very easy. It also update the model with the sample. Quick tour as IPython notebook here. Although LDA is a great algorithm for topic-modelling, it still has some limitations, mainly due to the fact that it’s has become popular and available to the mass recently. One major limitation is perhaps given by its underlying unigram text model: LDA doesn’t consider the mutual position of the words in the document. Documents like “Man, I love this can” and “I can love this man” are probably modelled the same way. It’s also true that for longer documents, mismatching topics is harder. To overcome this limitation, at the cost of almost square the complexity, you can use 2-grams (or N-grams)along with 1-gram. Another weakness of LDA is in the topics composition: they’re overlapping. In fact, you can find the same word in multiple topics (the example above, of the word “can”, is obvious). The generated topics, therefore, are not independent and orthogonal like in a PCA-decomposed basis, for example. This implies that you must pay lots of attention while dealing with them (e.g. don’t use cosine similarity). For a more structured approach – especially if the topic composition is very misleading – you might consider the hierarchical variation of LDA, named H-LDA, (or simply Hierarchical LDA). In H-LDA, topics are joined together in a hierarchy by using a Nested Chinese Restaurant Process (NCRP). This model is more complex than LDA, and the description is beyond the goal of this blog entry, but if you like to have an idea of the possible output, here it is. Don’t forget that we’re still in the probabilistic world: each node of the H-DLA tree is a topic distribution. If you’re very curious on LDA, here is a quick example. Markov chains, named after Andrey Markov, are mathematical systems that hop from one “state” (a situation or set of values) to another. For example, if you made a Markov chain model of a baby’s behavior, you might include “playing,” “eating”, “sleeping,” and “crying” as states, which together with other behaviors could form a ‘state space’: a list of all possible states. In addition, on top of the state space, a Markov chain tells you the probabilitiy of hopping, or “transitioning,” from one state to any other state—e.g., the chance that a baby currently playing will fall asleep in the next five minutes without crying first. A simple, two-state Markov chain is shown below. With two states (A and B) in our state space, there are 4 possible transitions (not 2, because a state can transition back into itself). If we’re at ‘A’ we could transition to ‘B’ or stay at ‘A’. If we’re at ‘B’ we could transition to ‘A’ or stay at ‘B’. In this two state diagram, the probability of transitioning from any state to any other state is 0.5. Of course, real modelers don’t always draw out Markov chain diagrams. Instead they use a “transition matrix” to tally the transition probabilities. Every state in the state space is included once as a row and again as a column, and each cell in the matrix tells you the probability of transitioning from its row’s state to its column’s state. So, in the matrix, the cells do the same job that the arrows do in the diagram. If the state space adds one state, we add one row and one column, adding one cell to every existing column and row. This means the number of cells grows quadratically as we add states to our Markov chain. Thus, a transition matrix comes in handy pretty quickly, unless you want to draw a jungle gym Markov chain diagram. Did you notice how the above sequence doesn’t look quite like the original? The second sequence seems to jump around, while the first one (the real data) seems to have a “stickyness”. In the real data, if it’s sunny (S) one day, then the next day is also much more likely to be sunny. We can minic this “stickyness” with a two-state Markov chain. When the Markov chain is in state “R”, it has a 0.9 probability of staying put and a 0.1 chance of leaving for the “S” state. Likewise, “S” state has 0.9 probability of staying put and a 0.1 chance of transitioning to the “R” state. In the hands of metereologists, ecologists, computer scientists, financial engineers and other people who need to model big phenomena, Markov chains can get to be quite large and powerful. For example, the algorithm Google uses to determine the order of search results, called PageRank, is a type of Markov chain. Above, we’ve included a Markov chain “playground”, where you can make your own Markov chains by messing around with a transition matrix. Here’s a few to work from as an example: ex1, ex2, ex3 or generate one randomly. The transition matrix text will turn red if the provided matrix isn’t a valid transition matrix. The rows of the transition matrix must total to 1. There also has to be the same number of rows as columns. While not a new concept, gamification has been catching on in recent years as organizations figure out how best to utilize it. After a period of experimentation, many companies are starting to realize how effective it can actually be. Most of the time this is used as a way to boost the customer experience by fostering more interaction and a spirit of competition and gaming, all to benefit the overall bottom line of the business. More recently, however, gamification is being used in other matters, more specifically being directed internally to the employees themselves. In fact, a report from Gartner predicts that 40 percent of global 1000 organizations will use gamification this year to transform the way their businesses operate. As can be learned from the experiences of some organizations, gamification can also be used to tackle some serious issues, such as helping workers overcome their fear of failure. To better understand how gamification can eliminate certain fears, it’s best to start with a clear understanding of what the concept is. According to gamification thought leader Gabe Zicherman, it is “the process of engaging people and changing behavior with game design, loyalty, and behavioral economics.” Essentially, it applies the joy of playing a game with topics and activities that might not be considered so enjoyable. Very few people like to fail, let alone confront the reasons why they failed. It’s a touchy subject that often requires a delicate hand to manage. With that in mind, it may seem strange that a game could help employees face their fears of failure, but that’s exactly what’s being done, often to good results. One organization that has taken this idea and run with it is DirecTV. The satellite television company recently had a few IT project failures and decided it needed to address how to face these shortcomings. IT leaders came up with the idea to create a gamification learning platform where IT workers could discuss failure by creating and viewing videos about the subject. Simply creating the platform and posting videos wasn’t enough. IT leaders needed to come up with a way to make sure employees were using it and posting videos of their own. This all had to be done privately with enhanced network securitydue to the potentially sensitive nature of the videos. The gamification aspect comes in by awarding points and badges to those workers who do make use of it. Prizes were even given to those who scored the most points from the platform. The result was a major increase in usage rate among the IT staff. In fact, not long after the platform was launched, the company was experiencing a 97 percent participation rate, with most workers giving positive feedback on the experience. Based off of DirecTV’s gamification, employees were able to talk openly about failing, discuss why the failures happened, and improve on their overall performance. IT leaders for DirecTV said later projects were completed much more smoothly as the whole staff became more successful. From this experience, other organizations may want to use gamification to eliminate the fear of failure among their own staffs, so it’s helpful to take note of a number of factors that can help businesses achieve this goal. First, gamification platforms need to be intuitive and all actions need to relate to the overarching goal (in this case, facing the fear of failure). Second, newcomers should have a way to start on the platform and be competitive. Facing other employees that have a lot of experience and accumulated points can be intimidating, so newcomers need a good entry point that gives them a chance to win. Third, the platform should constantly be adjusted based off of user feedback. Creators who make the platform and don’t touch it afterward will soon see participation rates drop off and enthusiasm wane. And last, a gamification platform that doesn’t foster social interaction and competition is a platform not worth having. Gamification allows employees to confront failure in a setting deemed safe and fun. People don’t enjoy failure and often go to great lengths to avoid even the very prospect of it, but sometimes to succeed, risks have to be taken. By helping workers overcome this fear with gamification, businesses can ensure future success and a more confident environment. It may seem a little outside the mainstream, but turning the fear of failure into a game can actually pay big dividends as employees learn there’s nothing wrong with trying hard and coming up short. BlueData, a pioneer in Big Data private clouds, announced a technology preview of the Tachyon in-memory distributed storage system as a new option for the BlueData EPIC platform. Together with the company’s existing integration with Apache Spark, BlueData supports the next generation of Big Data analytics with real-time capabilities at scale, which allows organizations to realize value from their Big Data that wasn’t before possible. In addition, this new integration enables Hadoop, Hbase virtual clusters, and other applications provisioned in the BlueData platform, to take advantage of Tachyon’s high performance in-memory data processing. Enterprises need to be able to run a wide variety of Big Data jobs such as trading, fraud detection, cybersecurity and system monitoring. These high performance applications require the ability to run in real-time and at scale in order to provide true value to the business. Existing Big Data approaches using Hadoop are relatively inflexible and do not fully meet the business needs for high speed stream processing. New technologies like Spark, which offers 100X faster data processing, and Tachyon, which offers 300X higher throughput, overcome these challenges. However, incorporating these technologies with existing Big Data platforms like Hadoop requires point integrations on a cluster-by-cluster basis, which makes it manual and slow. With this preview, BlueData is streamlining infrastructure by creating a unified platform that incorporates Tachyon. This allows users to focus on building real-time processing applications rather than manually cobbling together infrastructure components. We are thrilled to welcome BlueData into the Tachyon community, and we look forward to working with BlueData to refine features for Big Data applications,” said Haoyuan Li, co-creator and lead of Tachyon. The BlueData platform also includes high availability, auto tuning of configurations based on cluster size and virtual resources, and compatibility with each of the leading Hadoop distributions. Customers who deploy BlueData can now take advantage of these enterprise-grade benefits along with the memory-speed advantages of Spark and Tachyon for any Big Data application, on any server, with any storage. If you wish to process huge piles of data very, very quickly, you’re in luck. From the comfort of your own data center, you can now use Google’s recently announced Dataflow programming model for processing data in batches or as it comes in, on top of the fast Spark open-source engine. Cloudera, one company selling a distribution of Hadoop open-source software for storing and analyzing large quantities of different kinds of data, has been working with Google to make that possible, and the results of their efforts are now available for free under an open-source license, the two companies announced today. The technology could benefit the burgeoning Spark ecosystem, as well as Google, which wants programmers to adopt its Dataflow model. If that happens, developers might well feel more comfortable storing and crunching data on Google’s cloud. Google last year sent shockwaves through the big data world it helped create when Urs Hölzle, Google’s senior vice president of technical infrastructure, announced that Googlers “don’t really use MapReduce anymore.” In lieu of MapReduce, which Google first developed more than 10 years ago and still lies at the heart of Hadoop, Google has largely switched to a new programming model for processing data in streaming or batch format. Google has brought out a commercial service for running Dataflow on the Google public cloud. And late last year it went further and issued a Java software-development kit for Dataflow. All the while, outside of Google, engineers have been making progress. Spark in recent years has emerged as a potential MapReduce successor. Now there’s a solid way to use the latest system from Google on top of Spark. And that could be great news from a technical standpoint. “[Dataflow’s] streaming execution engine has strong consistency guarantees and provides a windowing model that is even more advanced than the one in Spark Streaming, but there is still a distinct batch execution engine that is capable of performing additional optimizations to pipelines that do not process streaming data,” Josh Wills, Cloudera’s senior director of data science, wrote in a blog post on the news. Software developers at Lockheed Martin [NYSE: LMT] have designed a platform to make big data analysis easier for developers and non-developers and are open sourcing the project on GitHub, a popular web-based hosting service. 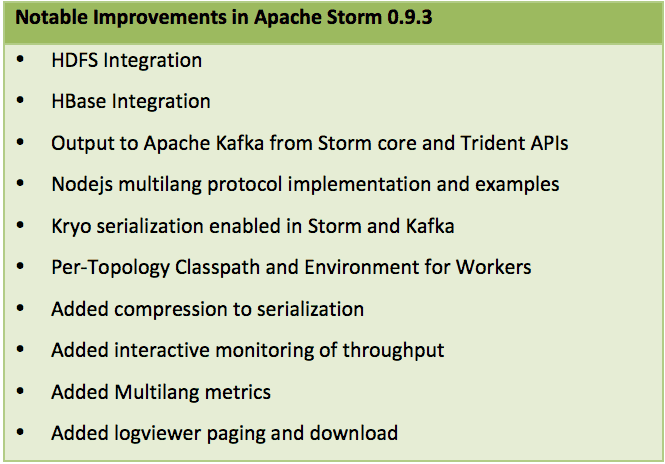 The StreamFlow™ software project is designed to make working with Apache Storm, a free and open source distributed real-time computation system, easier and more productive. A Storm application ingests significant amounts of data through the use of topologies, or set of rules that govern how a network is organized. These topologies categorize the data streams into understandable pipelines. The ultimate goal of StreamFlow is to make working with Storm easier and faster, allowing non-developers and domain experts of all kinds to contribute to real-time data-driven solutions,” said Jason O’Connor, vice president of Analysis & Mission Solutions with Lockheed Martin Information Systems & Global Solutions. “The next step in data analytics relies on the inclusion of diverse expertise and we envision this product contributing to fields ranging from systems telematics to cyber security to medical care.” Companies currently using Apache Storm to repartition streams of data include Twitter, Spotify and The Weather Channel. The StreamFlow software introduces a dashboard to monitor metrics, high-level protocols to make coding more interoperable, and a graphical topology builder to make assembling and monitoring topologies in Storm much easier for beginner programmers and users without software development experience. StreamFlow was open sourced on Lockheed Martin’s GitHub account for users to install on their own desktops. Installing StreamFlow is much like installing typical web applications, though some configuration may be necessary. The software is released under the Apache 2 license and can be freely downloaded and built from GitHub. The software contains a front end user interface supported by a series of web services. Future plans include open sourcing of additional frameworks and support for further real-time processing systems like Apache Spark. Headquartered in Bethesda, Maryland, Lockheed Martin is a global security and aerospace company that employs approximately 113,000 people worldwide and is principally engaged in the research, design, development, manufacture, integration and sustainment of advanced technology systems, products and services. The Corporation’s net sales for 2013 were $45.4 billion.